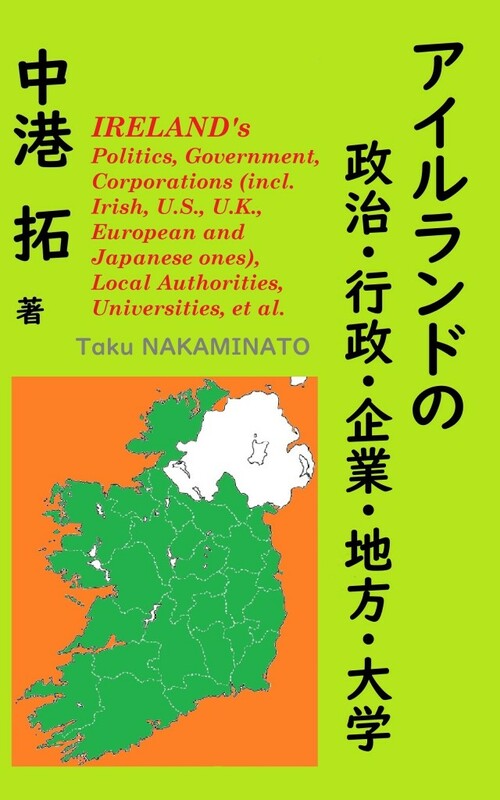 アイルランドの政治・行政・企業・地方・大学　Ireland’s Politics, Government, Corporations, Local Authorities, Universities, et al. Ireland’s Politics, Government, Corporations, Local Authorities, Universities, et al. This eBook dismantles Ireland’s Parliament, Government, corporations, Local Authorities, and universities, and “objectively” explains outlines of each organization. There, the author shows each org’s key people, principal businesses, financial condition, history, et al., along with over 15 thousand footnotes – URLs of sensible and interesting information written in English. While this eBook contains explanations on political parties, politicians, administrations, and corporate activities, it remains “neutral/non-political” from beginning to end – from international as well as domestic viewpoints. If he may, he would say it can give you a bit understanding of Ireland, or what a nation consists of.